Charles Zembillas: Flyin' High Crash! I hope Crash won't crash into a window...or maybe he will?? We will never know. I keep looking at this picture and I can't tell if something has changed or not. Crash looks a lot...smaller, I think? He also kind of looks young too! I downloaded an emulator on my phone and played the Crash trilogy. How people were able to complete Crash 1 100% is beyond me. Hey charles i really want to ask you a question: What kind of pants crash bandicoot wear? does he wear a long jeans or shorts? and how do crash's pants never full down? i mean crash doesn't wear belt or there's no buttons? Crash looking great as always, I'd love one day to see a cartoon or something in this style with some quality animation. I was wondering: will you ever draw other characters from the series? Not just Crash or Cortex but others like Tiny, Dingodile, Coco, and (my personal favourite) Ripper Roo? It would be really interesting to see them updated and see the difference from the original concept arts for the games with the new ones. Bandicoot Power! 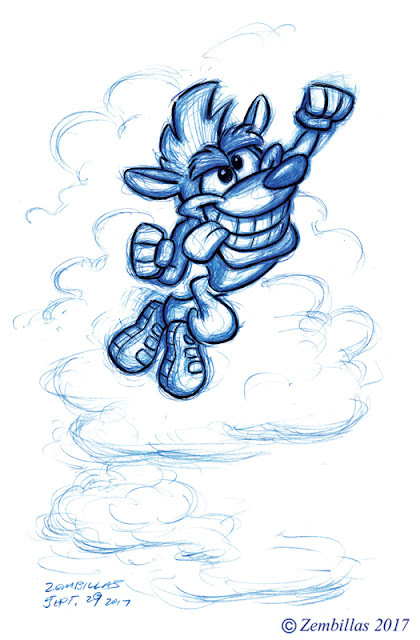 Joking aside for a battle cry nice Crash art, love that you portray Crash heroic and goofy looking. Something that I think Naughty Dog wanted to portray for Crash but I don't think they successfully did. Say Charles when you and Joe Pearson when working on the game and designing the characters did you get some input that would help reflect the personality of the characters with the designs? Howdy folks! You would be a good art director Crash Latte. Indeed he is a little off model. I realized it after the black line went down. Anyway the shortness is due to the angle of the pose. Plus this was practice after not drawing Crash for a long time. I may do mit again and see if I can improve it. Hi Mick Jason. He's a cartoon character. They have their own physics including how their pants stay up. Crash was designed super simple for the original Playstation and I Like to portray him with his original clothing. I've drawn belts before and tried different styles over the past few years. Maybe I'll try some new stuff again. Gabriele thank you! I'll draw some of the other characters that would be fun. Will give it a go! Hey Hazman. Thank you I had a good time with this. Felt positive drawing Crash again. As far as personality input as much as I recall there may have been some basic things. You could tell personality from Joe's concepts. They depended on us to build personality. The input was pretty much to get the ball rolling in a general direction and then we took it from there. Thank you Russkie I will indeed try my best to do my best! Which is why I redid Crash just now. You're correct in your assessment of the spirit of the drawing.